1 Oz 999 fine investment grade platinum bar. Each bar provided is guaranteed to be a 1 oz investment grade platinum bar with a minimum fineness of 999. 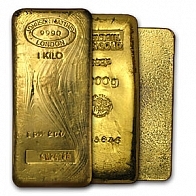 All bars sold are guarnteed to be a London Bullion Market Association (LBMA) approved brand. These bars are sold at our lowest available platinum premiums, and the brand supplied is based on current market availablilty. This listing is for 20 x 1 Oz platinum bars. 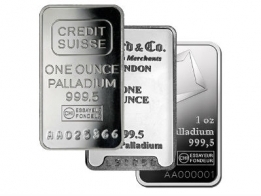 These bars are a great option for individuals looking to buy platinum bars in larger quantities, or those looking to invest into platinum at lower premiums. 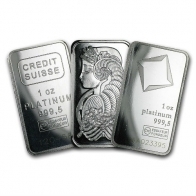 These platinum bars are an excellent option for individuals looking to invest in platinum at a low premium. Please contact us to sell 1 oz platinum bars.